Can Seven give Felix the courage to face his destiny as Findo Unum? 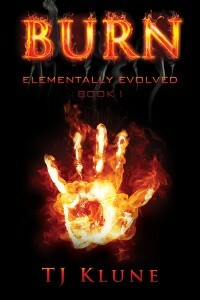 Burn by TJ Klune, now available from Dreamspinner Press. Though Felix’s arrival brings great joy to the Elemental world, it also heralds a coming darkness. No one knows this better than Seven, the mysterious man who rescued Felix from that horrible fire years ago and then disappeared… who now has returned to claim what’s rightfully his: Felix’s heart. But even as Felix begins to trust Seven and his feelings about his place in the world, the darkness reveals itself, bringing consequences no one could have predicted.